Do TV egg products work for farm eggs? I spent most of my day yesterday trying out "As seen on TV" egg gadgets. I steamed eggs, boiled eggs, shook eggs and shoved them through weird plastic contraptions. It was enlightening. We've all seen these ads with kitchen products that cook or peel your eggs easily right? They make egg preparation look easy and effortless, but I wanted to know if they actually worked. 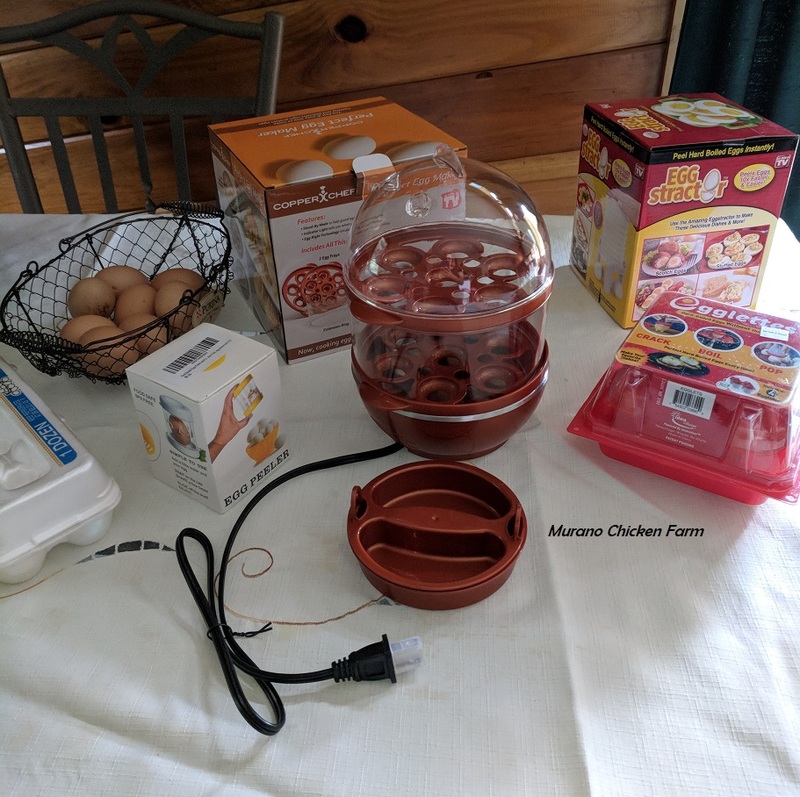 More importantly...do these kitchen gadgets work on farm fresh eggs? 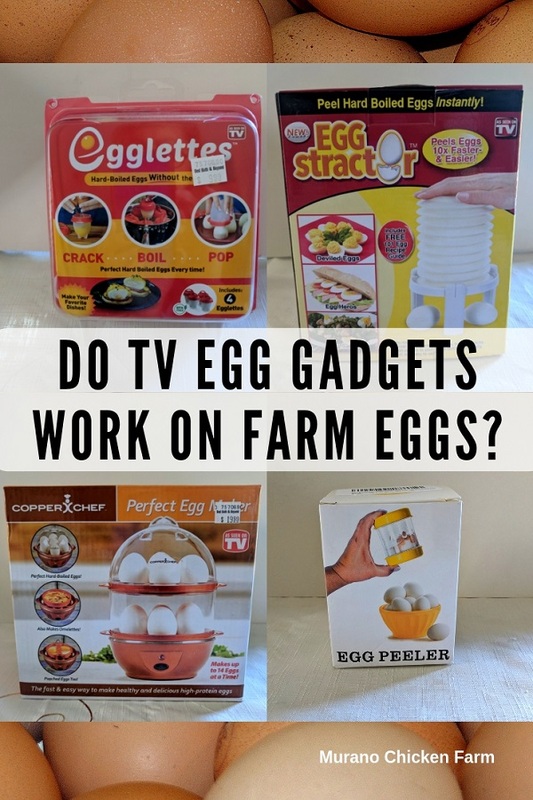 Being that fresh eggs are notoriously harder to peel than store bought eggs, I wasn't sure that these egg gadgets would be up for the challenge. To conduct this experiment I bought the Eggstractor, Egglettes, Perfect Egg Maker and the Negg and I'm giving a full review on each egg preparation product. I was pleasantly surprised at how many of these products worked for farm fresh eggs! I had assumed that all the egg peeling tools would not work at all and was really glad to be wrong...mostly. Let's start with the Egglettes. This is a set of 4 silicone cups with lids. You crack your eggs into the cups and screw the tops on, then boil them just like you are hard boiling eggs. 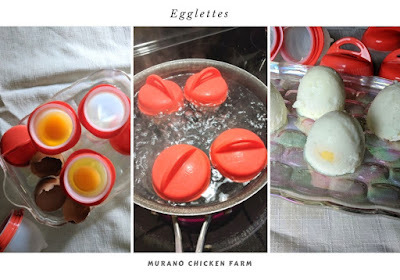 Egglettes are very easy to use and the directions are clear and thorough. These work pretty well and they eliminate the issue of having to peel the eggs since you don't cook the shell at all. 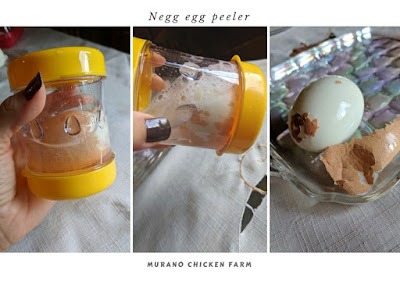 This is awesome for those who don't want to fuss with peeling difficulties of farm fresh eggs. One warning: don't skip the oil. You'll need to oil the inside of each Egglettes before adding the raw egg. If you don't, then the egg is harder to get out and doesn't look as nice. If you do though, you've added oil to your eggs and not everyone wants to do that. I did it both ways and the eggs are much harder to get out without the oil. To remove the egg you'll have to run a spoon around the inside of the egg at the top then squeeze the silicone container to pop the egg out. If you don't oil the Egglettes you'll need to scoop the egg out with the spoon. Either way you don't really lose a lot of egg, they just don't look smooth without the oil to lubricate the silicone. If you didn't oil the Egglettes there will be egg residue left inside the Egglettes which will need cleaned out before next use. If you did oil them, you'll need to clean out the oil anyway but it's much easier than scrubbing egg out. They are dishwasher safe though, so that shouldn't be much of a problem. The eggs cooked using Egglettes were the same as any other hard boiled egg, except the tops had a slightly crunchy edge where I assume they got too well done. Since the water does not cover the top of the egg, the yolks were slightly less done at the top of some of the eggs, but not others. All in all, these did work and kept me from having to peel hard boiled eggs! This item retails for $10. If you want to get a set of 4 Egglettes for yourself you can find them on Amazon. Next up is the Negg. I actually think I have a generic one since mine came without any brand name on it. I bought it on Amazon since I couldn't find it in stores. It worked pretty well though so we'll just proceed with the Negg review! The Negg is a plastic cylinder with a removable top and bottom. You remove the top and fill it with water up to the ridge on the inside. The ridge is about half way up. Add your hard boiled egg and snap the top back on. Start shaking. As you shake the egg crashes into all the surfaces cracking the eggshell into tiny bits which then fall off leaving the egg covered in membrane only. In theory. In reality it takes a long time! I gave up when my egg was about halfway peeled but after removing the egg from the Negg, the membrane and remaining shell slid right off. I tried this with both store bought eggs and farm fresh eggs. The farm fresh egg took longer to peel this way, but they all peeled smoothly. This works, plus it's super easy to clean up! This item retails for $10. If you want to get a Negg for yourself you can find it on Amazon. After my win with the Negg I decided to try the EGGstractor. *sigh* I guess you can't win 'em all and this product was definitely a fail! The EGGstractor is an bellows style plastic piece that fits over a stand in which you place your egg. You are supposed to push down really hard and the egg shoots out the bottom with no shell on. First thing the instructions say is to pierce the small end of the egg using a plastic nub they call a piercer on the base. Then you are to fully crack the large end by tapping it on a hard surface a few times. Next you'll place your egg in the base large end down and put the top over it. Then you place your hands on top of the EGGStractor and give it one hard push to shoot the egg out the bottom sans shell. Except, it didn't work. So I repositioned the egg and tried again. And again. It almost worked on try number 5! The farm egg came out but the shell was still on. Broken, but still on. I kept trying. This is already more work than just peeling the egg. Unfortunately it only partially peeled the store bought egg and only cracked the shell on the farm fresh egg. It also cracked through the egg white to expose the yolk on both eggs. I ended up opening the eggs, taking out the yolks then running the whites under water to remove the shell. This is a fail. I tried multiple eggs even followed the EGGstractor troubleshooting guide and every one was a fail. This item retails for about $9 now due to bad reviews. Apparently it was more in the beginning. 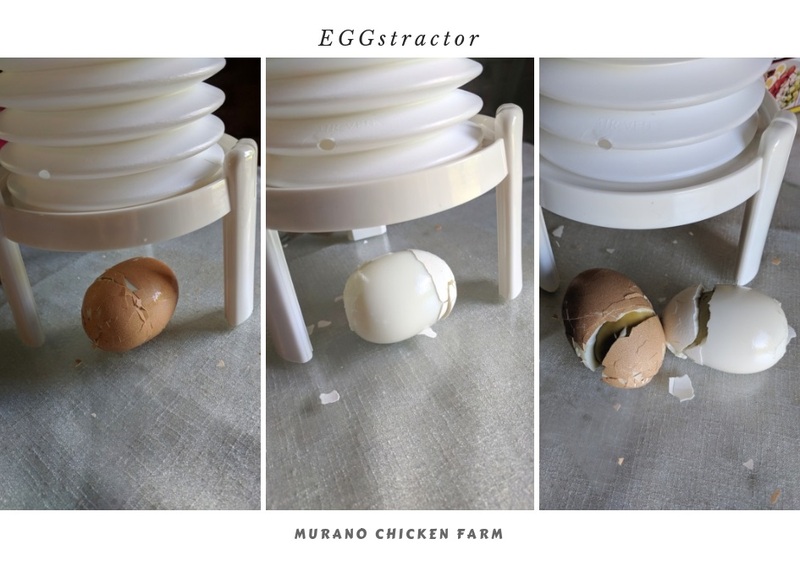 However, if you want to try the EGGstractor for yourself you can find it on Amazon. 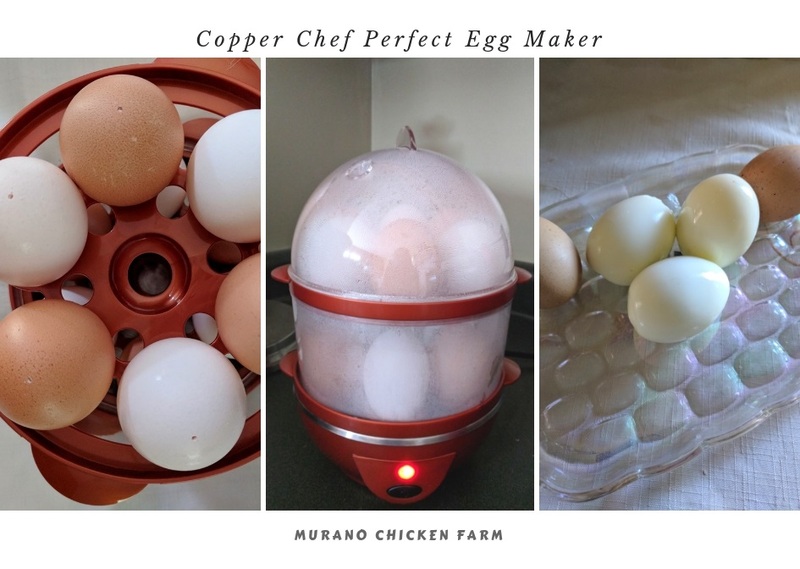 Last up is the Copper Chef Perfect Egg Maker. This is an egg steamer with 2 trays inside for a maximum capacity of 14 eggs. There are optional omelette and poached egg trays but I only used the steaming capabilities this time. It was simple to use. Use the enclosed water cup to measure how much water you need to add depending on how many eggs you're steaming. Pour water into the base of the unit. Add first egg tray to unit. Turn cup over exposing a pin like metal piece. Pierce the wide end of each eggshell and place them small end down in the egg trays. Once the unit is assembled and the egg trays are full, place the lid on top. Plug in the unit then press the button and let it do it's thing. Once done the unit will turn off. The tips and tricks section says to place the eggs into an ice water bath once the unit turns off to stop the cooking process. One thing I noticed when the eggs were done cooking was a slight cooked smell coming from the unit. The last bit of water somehow scorched in the bottom of the unit. It wasn't a bad smell and it cleaned up easily with some water. Once cooled I peeled the eggs that I had cooked in the Perfect Egg Maker. I was happy to see that the eggs I collected this week peeled very easily with no pieces of egg sticking to the shell. They actually peeled better than the store bought eggs. This egg steamer works perfectly! This item retails for $20. 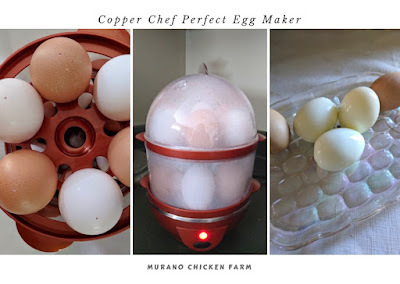 If you want to get a Copper Chef Perfect Egg Maker for yourself you can find it on Amazon. 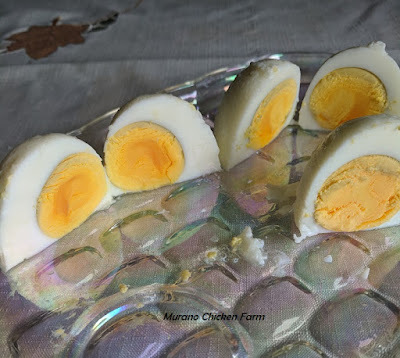 Want to know more about farm fresh chicken eggs? Click here for everything you ever wanted to know about eggs! I purchased almost all of these items at Bed, Bath and Beyond though they can be ordered through Amazon (links provided) Walmart or Ebay. Don't forget to use a BB&B coupon if you go there! I was not asked to review these items, I just thought it would be a fun experiment. Thanks for this. One never knows about those inexpensive gadgets. I've had a lot of fails. One thing I did discover for easy-peel, perfect hard-cooked eggs is the Instant Pot. More expensive but it's a multi-tasker and I use it a lot. I put my steamer basket, 1 cup of water, lid on, pressure seal on. Set Manual for 3 minutes. Turn the Instant Pot OFF and let it depressurize for 10 minutes. Throw a towel over the steam vent and open it to let all the steam out and the pressure normalize. No need to stand there and watch. Then take the eggs out and refrigerate them. They peel like a breeze and are always perfect. Hi Anita. I have been considering getting an instant pot but haven't bought one yet. Glad to know it works for eggs. I'm going to put one on my Christmas list (since my mom is already asking lol) Thanks for the tip! I have The Perfect Egg Maker and I love it! I, like you had great results when I tried it and have never had a problem since. I wouldn't know what to do without mine! Definitely worth the money! I really couldn't believe how easy it was to use the perfect egg maker, and you're right it was worth every cent!